Only two days remain until Star Trek: Discovery season 2 premieres on CBS All Access. To hype the show’s return, the streaming service has released the opening title sequence for the upcoming batch of episodes. It’s not exactly a ground-up rebuild, but the new intro does feature a few subtle tweaks hinting at the new season’s events. You can check out the sequence via the series’ official Twitter account below. Overall, the new sequence doesn’t deviate very much from the sepia-toned opening of the first season. In fact, they’re basically the same for roughly the first 30 seconds, after which an exploded diagram of a Starfleet captain’s chair shows up in place of a space helmet. The biggest change comes at the 45-second mark, where we can see the winged silhouetted figure of what must be the Red Angel. Previous trailers have indicated that this mysterious cosmic entity will serve as the main antagonist for Star Trek: Discovery’s new season. The Red Angel’s threat is heralded by seven red bursts throughout the galaxy. Additionally, it grants a foreboding vision to Spock, who warns that the being’s presence will have life-ending consequences. Star Trek: Discovery’s new season will introduce a few recognizable faces from the Star Trek mythos. Aside from Ethan Peck’s Spock, Anson Mount will appear as Christopher Pike, who commanded the Enterprise before James Kirk. This season will show Captain Pike assuming control of the Discovery following the Red Angel’s arrival. 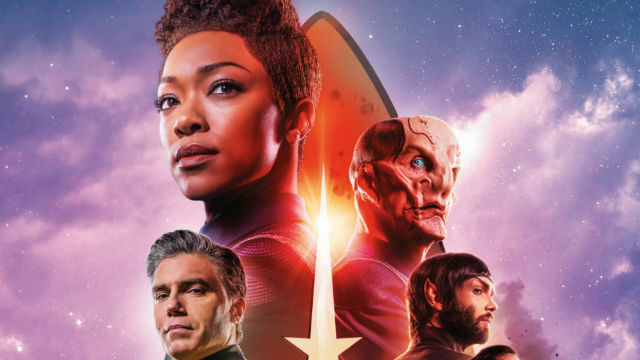 CBS All Access will premiere Star Trek: Discovery season 2 on Thursday, January 17. What do you think of the show’s new opening title sequence? Let us know in the comment section below!